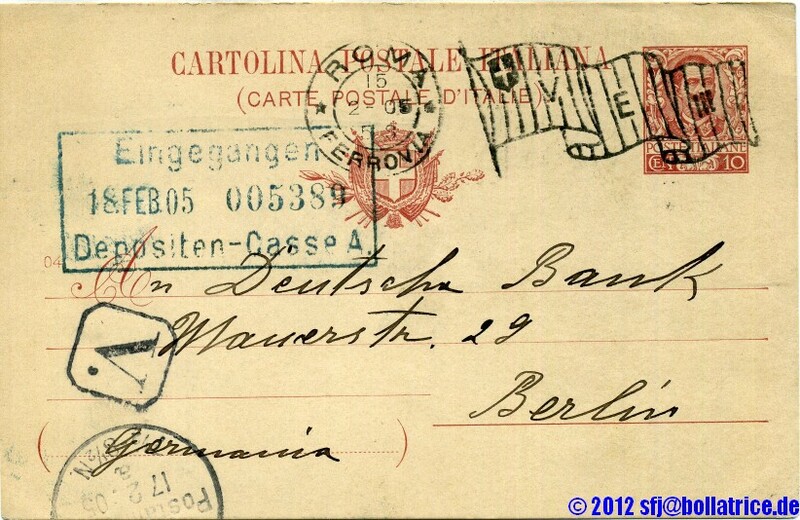 The latest additions to this article may be found on www.bollatrice.de, a german website dealing with all early stamp machines used in Italy. 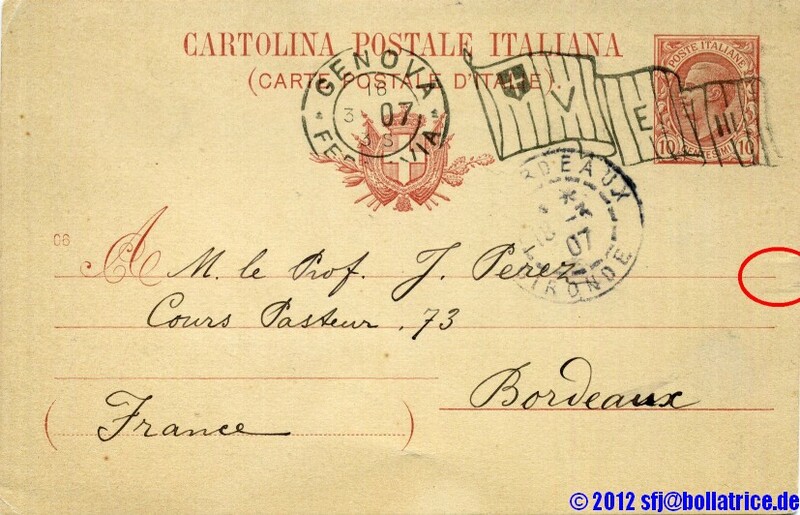 The Bickerdike machine from the Canadian Postal Supply Company was the first rapid cancelling machine used in Italy. It is recognized as a machine cancel even by non collectors. This distinguished it from the mechanical hand-stampers (also known as machines) such as Pearson Hill and Dani. The Italian Bickerdikes are easy to identify since they show unique flags: the flags show the cross of Savoy in the upper left corner and the letters "V E III", referring to King Victor Emanuel III. Some parts of this article are nearly complete, whereas others are still a working draft. Additional information on the Italian Bickerdikes is highly appreciated. The Order over five Bickerdike machines for Italy was placed in March 1901. J. Brooks Young used the order from Italy as a reason of the longer delivery times he offered to the German Reichspost. The five Bickerdikes were ordered for Genoa, Turin, Milan, Rome and Naples. The literature reports usages in 1901 for Roma (29. 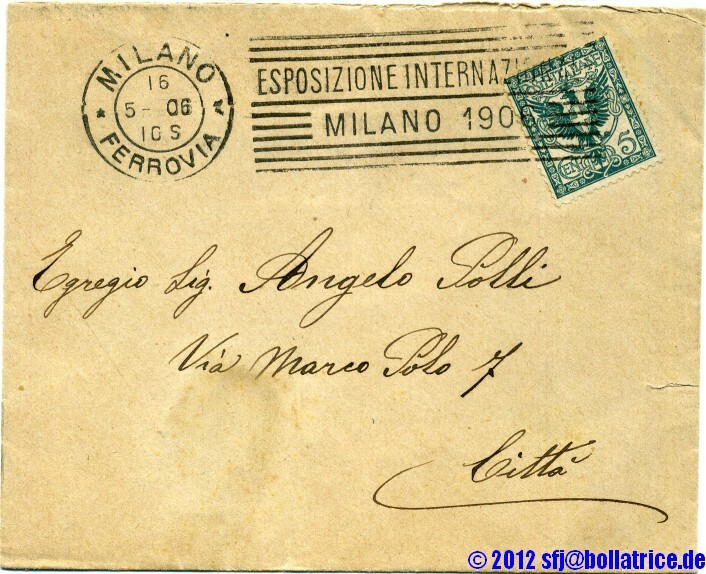 October 1901) and Napoli (20.12.1901). 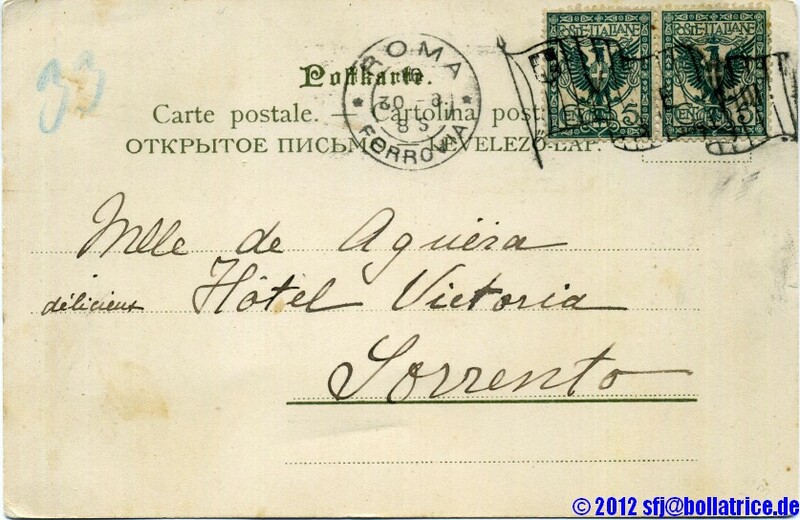 The first usage we could document for Milan originate in the early March 1902 (3.3.1902), for Genoa end of April (18.4.1902) and end of May for Turin (30. May 1902). This proves that the delivery was completed in the first half of 1902. The Italian order was placed and executed before J. Brooks Young had sold the European patents to the "Deutschen Waffen- und Munitionsfabriken (DWMF)". This means that the delivery was executed from Canada. And: the Italian Post could have difficulties to get spare parts, since DWMF would not feel responsible for these machines and Brooks no longer delivered to Europe. This possibly explains the differences in the usage periods. That one of the five original delivered Bikerdikes was transferred to Brescia seems logical, but I have no indication which one it was. Possibly this could be solved, when a Brescia cancel could be compared to the other ones, since at least some of the flags have distinct differences. One additional remark: 1909 Rome started to use a Krag continuous cancelling machine and in 1910 a Hey Dolphin "Flyer" was tested in Milano. Both machines were introduced to other post offices in the following years. Some remarks on this statistic: It is basede on two collections: one machine cancel collection, collected in more than 30 years and which covers all early cancel machines used in Europe. 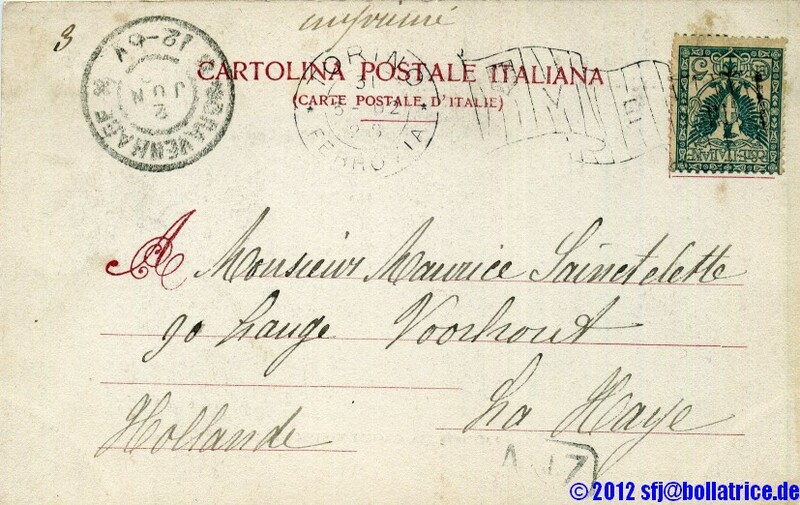 The Italian Bickerdike cancels from this collection mainly are on picture postcards to Germany. This could explain some preferences for the "main holiday season" in the above figures. 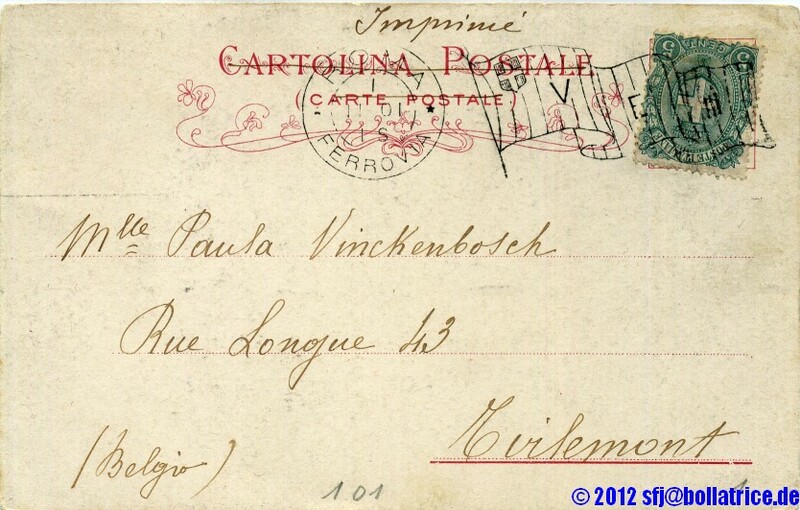 The other collection was collected within the last five years and consists mainly of postal stationary. All documents are within the usage periods mentioned by Ornaghi. The valuation of certain periods or post offices is in the responsibility of the reader. Ornaghi values all towns within the same year equal and has only small differences between the years. One additional remark: after the creation of these statistics I was able to buy parts of a collection of Italian Bickerdikes consisting of picture postcards send to Belgium and the Nederlands. The whole collection matches with the above shown figures. But I only bought some parts,so I am not willing to update the figures, since this will lead to different results. The date letters of the Italian Bickerdikes are type setted and not on type wheels as some of the Bickerdikes in other European Countries. So Bickerdikes with type setting errors are possible.Indeed we have observed some "capovolti" with one or more letters used inverted. They are not rare, but harder to find than regular Bickerdikes. One exception is that in the years 1902 to 1905 Rome used for September a 9 with a cutting error, which is the mirror image of a regular 9. A regular 9 is not observed in this timeframe. 1904 and 1905 the Roman Bickerdike show a strong deformation of the date stamp. Later cancels from Rome do not show this deformation. 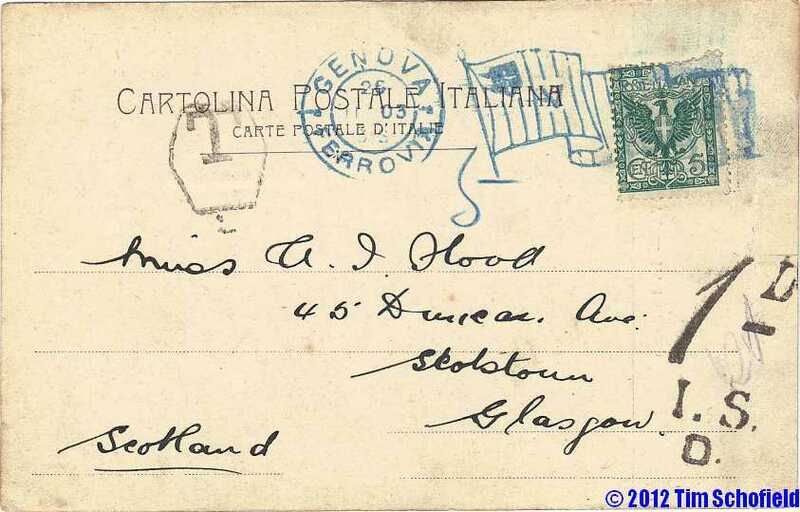 Genoa uses bigger digits in 1906 and 1907. Finding a Brescia cancel would possibly answer some of the open questions.